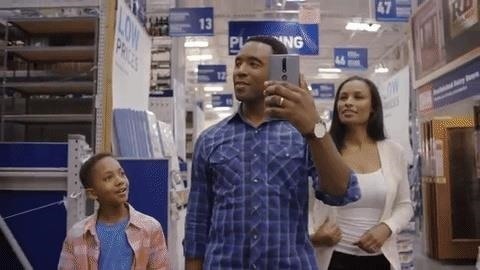 Lowe's Home Improvement laid another brick in their augmented reality foundation with today's announcement of a new app for Tango-enabled smartphones. The Lowe's Vision: In-Store Navigation app does just what it says in the title. On compatible phones, which include the Lenovo Phab 2 Pro and upcoming Asus Zenfone AR, customers with the app will be able to pinpoint locations of products in stores using augmented reality. The app takes advantage of Tango's motion tracking, depth perception, and area learning to accurately direct customers through the store, overlaying navigational prompts over the app's camera viewer. Customers will also be able to build and manage shopping lists through the app. "Our research shows that helping make it easier for customers to find products in stores not only makes for a better shopping experience, it allows our associates to spend more time advising on home improvement projects," said Kyle Nel, executive director of Lowe's Innovation Labs, in a press release. Availability of the store navigation functionality will be limited at first; Only customers at Sunnyvale, California and Lynwood, Washington stores will be able to use the navigation starting in April. Since not many Tango devices exist in the wild, the stores will have devices available for customers to demo the features of the app. The app is just the latest in a series of innovations that the home improvement retailer has revealed through their Lowe's Innovation Labs. Lowe's launched one of the first Tango-enable apps with their Lowe's Vision app, which allows customers to measure interiors and see how appliances and home décor will appear in their homes. The company has also partnered with Microsoft for their Lowe's Hologram Experience pilot, which uses the HoloLens to visualize kitchen renovations. Do you think apps like these would greatly improve the shopping experience? Let us know in the comments.